If you're planning on doing some fishing with a buddy this year, then it wouldn't be a bad ideal to consider purchasing a good two person fishing kayak can allow you to enjoy what you love doing best. There are different fishing kayaks to choose from. You want to pick the very best fishing kayaks for safety purposes, and ones that come with the best features that can allow you to enjoy your fishing trips. You don't want to skimp on quality fishing kayaks. You want a really good rigged fishing boat that's both durable, and easy to paddle up-stream. 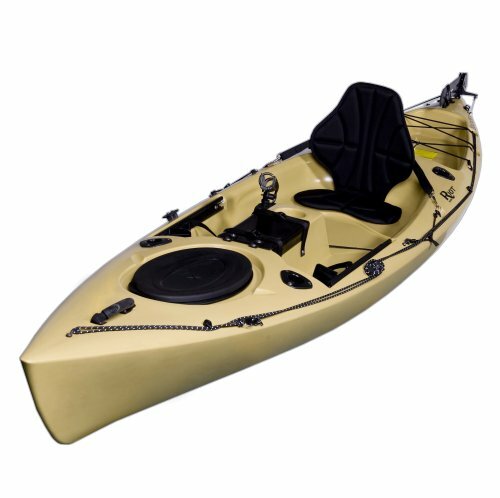 Down below are some of the different, but best fishing kayaks for two person kayaking available for oceans, rivers, or lakes out on the market. Sit in two person fishing kayaks are the most common ones for river streams, ponds, and small lakes. The disadvantage to some might be comfort, and could offer somewhat of an inconvenience. Sit in two person kayaks are easier to paddle though, but you're not provided with as much room. Most fishers like the sit on top kayaks better. Sit in canoes are cheaper. You can find some really cheap, but quality sit in two person fishing kayaks. Especially if you decide to buy an inflatable kayak, you can find some going for prices around $100 dollars. Inflatable kayaks have their advantages since they're not very heavy, and they're very easy to lug around. Inflatable kayaks are very sturdy though, and can hold between 400-500 pounds. Rivers and Lakes: One the best, and cheapest fishing kayak for two person kayaking is the Seylor Tahiti Fishing Inflatable Kayak. It comes in an olive green finish. Inflatable kayaks are okay for river streams, and lakes. It's 10 feet long and comes with two inflatable seats, along with two spray covers. This is the perfect camping or fishing boat that can go up light streams and lakes. Oceans: For oceans ideally you'll want something more rigid, bigger, and stronger. There aren't too many ocean two person sit in fishing kayaks out on the market. The on top kayaks are more popular for oceans. 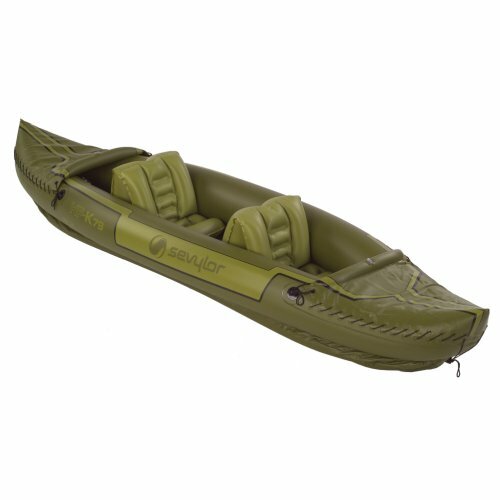 The Sea Eagle 330 Inflatable is one of the most popular, and versatile kayaks out on the market. It can be used for whitewater rafting, rivers, streams, recreational use, fishing, and for oceans as well. One of the disadvantages of the Sea Eagle is that it's not as spacious, and doesn't give a ton of leg room. It's very capable when it comes to kayaking, and withstanding whitewater rapids. It's listed as a class 3 whitewater rapid canoe. Meaning it can withstand smaller waves, and water rapids. I wouldn't say its a deep-sea fishing kayak. It's highly recommended for lakes, rivers, and shallow oceans. Sit on top kayaks cost more money, but they're the best fishing kayaks to buy. They're much more practical when it comes to fishing. In many ways sit on top kayaks are safer. You're not trapped inside a cockpit. Being right on top of the canoe allows you more room. As long as you don't mind getting wet, and spending more money, then the best fishing kayaks to buy are sit on top canoes. Sit on top two person kayaks are also longer, and more suited for larger lakes and for oceans. Oceans, Rivers, and Lakes: If you need a good sea fishing kayak, then the best one out on the market is the Ocean Kayak Trident 13 Angler Kayak. It's one of the best sit on top fishing canoes for ocean kayaking out on the market. 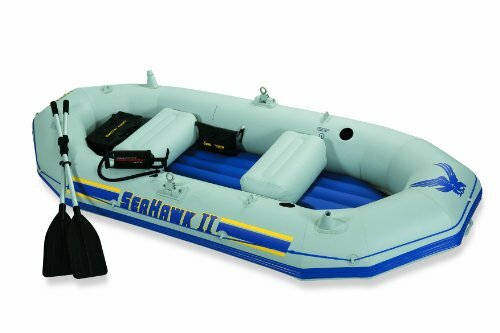 It comes with a battery storage bag in bow hatch, adjustable foot braces, small tackle box, angler graphic, two flush mounted rod holders, paddle keepers, sonar shield, and a large bow hatch with cross lock. It can be used for rivers, lakes, and particularly for oceans. It's very versatile and a durable rigid fishing boat. Prices are more expensive and go for around $1,000 dollars. You might find good deals online at amazon. I have never gone fishing in a two person kayak before but I have seen a lot of other people doing it and I have always wanted to go with my wife in one. I love to fish as well so this would be perfect. Thanks for the cool article.